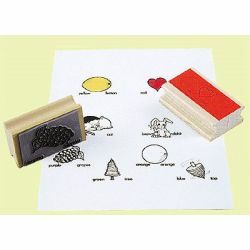 An aid to introduce colors, color words, and simple vocabulary words. Use for cut-and-paste activities and matching. Both primary and secondary colors can be taught with this set. SET INCLUDES: ORANGE-ORANGE, GREEN-TREE, BLUE-TOP, BROWN-RABBIT, PURPLE-GRAPES, YELLOW-LEMON, RED-HEART, AND BLACK-CAT.